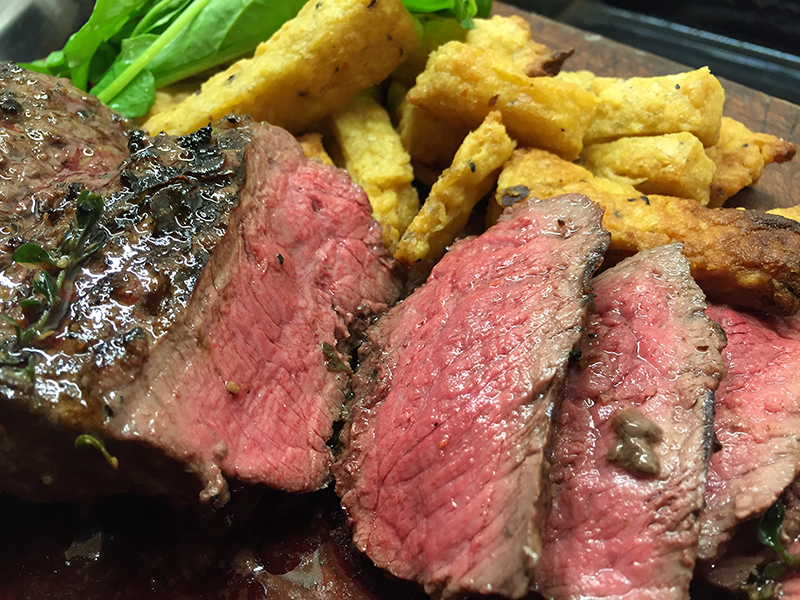 The joys of a thick, BBQ’d and sliced on the bias, ‘Italian Tagliata’ style steak are worth striving for. Knock it into shape (literally) and it makes a fantastic, thick steak. 1Take a 1kg joint of topside, untied and de-fatted, and place it on a chopping board and hit it with a mallet until it’s the required thickness. Aim for around 4cms. Tempting as it may seem, don’t go mad. It needs to be in one even piece with the grain of the meat all running in the same direction so, when the time comes, you’ll be carving across the grain. You’ll get a few uneven, raggedy, bits but so much the better – all the more tasty charred extremities for the cook. As well as tenderising, bashing it will open up the texture of the meat meaning it will cook quicker and absorb more flavour from your chosen marinade and baste. 2Once your topside is knocked into shape, place it in a plastic bag in the fridge with a crushed clove of garlic, six tbsp of olive oil, the juice of a lemon, a few cracked black peppercorns and a sprig or two of thyme. Leave overnight. 3When it comes to cooking time, remove from the bag and scrape off any attached solids. If barbecuing, light up now. 4Allow the beef to come up to room temperature and give it about three minutes high heat per side, basting with the marinade. 5Wrap in foil and leave on the edge of the barbecue to cook through and firm up for 10-15 minutes. 6Carve at an angle, across the grain in ½ - ¾ cm slices.